Congratulations to author Gare Joyce and the fine folks at publisher Wiley. 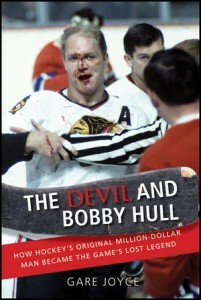 HockeyBookReviews.com has named their book The Devil and Bobby Hull as the 2011 Hockey Book of the Year! 2011 proved to be a tough year to choose a winner as there was no real runaway leader. Runner up was Jason Farris' Behind The Moves. Others that were seriously considered were The Lives of Conn Smythe by Kelly McParland, The Lost Dream: The Mike Danton Story by Steve Simmons, Wayne Gretzky's Ghost by Roy MacGregor, Cornered by Ron MacLean with Kirstie McLellan Day, Extraordinary Canadians: Maurice Richard by Charles Foran and Hockey Hall of Fame Book of Treasures. I gave The Devil and Bobby Hull because it was the one new book that I just could not put down. The content was rich and well researched. Gare Joyce's characterization of Hull was fascinating. The book was also entertaining with stories of the NHL's Original Six and the wacky WHA. Here's more on the 2011 Hockey Book of the Year! As the epic battles between Rocket Richard and Gordie Howe reached their zenith in the 1950s, another superstar arrived in the same stratosphere. Bobby Hull - hockey's Golden Jet - was every bit as good as his counterpart #9s. In fact, he was kind of a hybrid of the two. He had Howe's size and strength, and Richard's flare for the dramatic. But, for a variety of reasons, Hull's lasting legacy does not measure up with the likes of Howe or Richard or Orr or Jean Beliveau. Instead he is painted as a more dastardly character. His key role in jumping to the WHA ruffled many feathers, leaving him estranged for decades with the Chicago Blackhawks, the team he is most associated with and won the Stanley Cup with. The Wirtz family, owners of the team, held a deep grudge and did what ever they could to keep Bobby out. Of course the narcissistic Bobby also has himself to blame in his tainted legacy, thanks to a very messy and very public divorce (Tiger Woods could relate) that swirled with domestic violence. Gare Joyce offers a look at one of hockey's greatest players in The Devil and Bobby Hull: How Hockey's Original Million-Dollar Man Became the Game's Lost Legend . As Joyce says, "the world of hockey glory was his to lose. And he did." Read the full HockeyBookReviews.com review.